It was two Wednesdays into December, not far from Christmas. The day was as usual –sun washed and arid. I’d driven down 3,000 feet below the mountain valley in which I live with my husband to the plains in Boulder. I’d hoped to avail myself of all things festive for the holiday season. 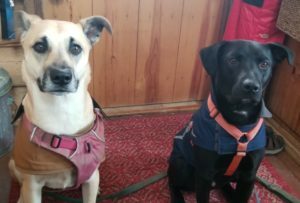 I met a dog – and not just any. This one would turn out to be our next dog. It’d been early October when Linus, our ten-year old Lab-Shar-pei left us with a terminal diagnosis of bone cancer. The void in the pack was traumatic and sudden, undoing us all. I was feeling lost and stressed without Linus. Our alpha females, ritually balanced with Linus’ grounding beta energy, were in a heightened state of challenging each other for position. The elder, incontinent 12-year old one was losing – we had to find another pack member, but soon. Turning left onto Arapahoe, I spotted him trotting across the street with his guy. Sweet dog, I reflected. Impulsively, I turned into Home Depot in search of a little something for my scientist husband. After wandering around a time, I chanced across a musical Snoopy adorned with a flashing Christmas present. A squeeze of the paw elicits Vincent Guaraldi’s theme, Lucy and Linus. I snatched it up in my arms, smiling. 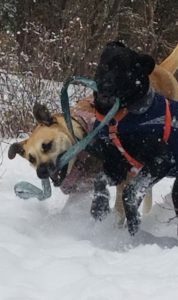 I found a line populated with the same little bla ck Labrador mutt and his guy. There is never a dog I don’t want to touch. Promise me, you won’t pet the dogs in India! My Hindu friend made me swear years ago. You don’t know what they are carrying, and they will bite you! Leaning down, I smiled. The little Labrador mutt leaned in, licking my face. What a great dog, I blurted, I’ve been looking for a dog just like this. His guy smiled back. I just adopted him a few days ago. I’m going to train him – then find him a permanent home. Charlie’s guy had a thought in mind — to rescue a dog unlikely to find a home otherwise. 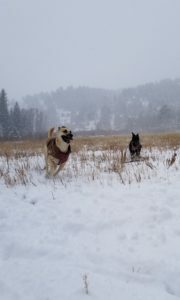 Charlie was it – having been passed over at the Boulder Valley Humane Society for a month and counting. Reminded of a past dog he’d once owned and needed to do right by, his guy adopted him on the day his Oklahoma rescuers were seriously beginning to worry for his fate. We were really worried he wasn’t finding a home, Sherry later shared with me when I sent her pictures of where Charlie now lives. I’m going to cry, we couldn’t be happier for him! Black animals spend far more time in shelters than their lighter counterparts. Turns out, racism knows no boundaries where species are concerned. Charlie’s guy and I stayed in touch over the holidays. When it was time to reconnect, he brought him up to meet our two Shepherd mutts. It’s been just five weeks since we decided Charlie should stay, calling our mountain valley his furever place to live. Charlie is from a part of Oklahoma where the regard for the life of a dog is as low down on the list as a bright, shiny pickup truck is high. Spaying & neutering have escaped their awareness, creating an overpopulation of unwanted dogs and cats of overwhelming proportions. He was a stray, not an uncommon ancestry for dogs of his origin coming up from the South. 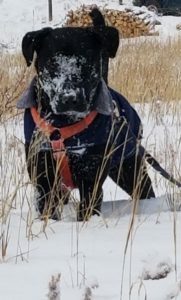 Born to no one and cared for by few, he’d wandered around in search of the occasional meal and fresh water, never landing his soft Labrador mutt self on any couch he could call his own. He did so for the first eight months of his little dog life, until a compassio nate spirit brought him into a rescue. He then stayed in foster care with Sherry, a woman of 74-years young, who operates an Oklahoma-based nonprofit, SPAR – Saving Pets at Risk. Dashing in and out of the dog door in her own home, Charlie grounded his little self in his new surroundings for a while, before climbing into the van leading him to shelter in Boulder. 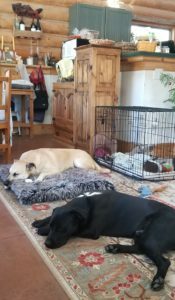 SPAR is one of many nonprofits without a building in which to house homeless dogs, relying, instead, on the magnanimous, patient, skilled and tireless efforts of volunteers to step up and foster the dogs until they can find a permanent, or furever home. With Charlie, there’s a quiet message coming through. He started off his young life knowing loneliness, deprivation, hunger, neglect and possibly, abuse. He now lives his life knowing love, nurture, good food, care, companionship, a pack of friends and a mountain valley to call his own. Charlie has re-grounded our pack, befriending our twelve-year old incontinent Shepherd mutt and rousting with our two-year old. He’s eagerly learning the basics – sit, down, come, stay – and one day, he may even learn to jump up on our bed. For now, he settles his sleek-furred black self onto our couch at night in front of a warm fire. He’s a simple, calm, authentically earnest and sweet canine spirit who’s ever so grateful just to have a home. His quiet strength has led him to survive to find his way to us through a circuitous route, because he had people looking out for him. From the person rescuing him from the streets of Oklahoma to Sherry from SPARS, to the people driving him up to Boulder, to the care workers at the shelter and Charlie’s guy who later came along and adopted him before we met, all were angels overseeing the well-being of one little lost soul. If I feel hopeful about anything happening in our world these days, it’s for the wave of consciousness surrounding the lives of animals. He may have been unwanted by many in Oklahoma, but in our home he is wanted by us all. On that particular Wednesday in December, I found a musical Snoopy for my scientist husband, and for myself, I’d found my very own Charlie Brown.